First cut idllies into small cubes. Pre heat oil and fry the idllies to golden brown. Keep it aside. Pre heat a drop of oil in a pan, splutter mustard seeds and cumin seeds, add asafoetida powder. Now add onions and fry it till it becomes transparent. Now add tomato to it , add turmeric powder, salt and cook it for another 5 mts. Add a little bit of water to it, so that tomato and onion cooks nicely. It will become like a paste or like thokku. Now add the ketchup to it and mix it well. Now add the fried idlies to it and mix it well. Garnish it with corinader leaves. Serve it hot with onion raita. We can also add a pinch of garam masala powder to the tomato onion thokku. Thanks guys, In saravana Bhavan they call it kaima or keema (not sure) idly. Its very very spicy there in Saravana. 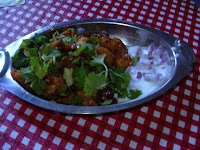 Fried idly looks yummy & spicy . will try ..
Nice way to use up the leftover idlis! 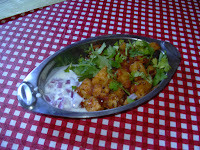 Fried idli looks spicy and delicious...Never tried it will try this time. Hey vidya, The kaima idly preparation you posted is totaly different from hotel. I have eaten this recipe in Saravana bhavan several times and I found out from the server that those idly pieces are dipped in seasoned besan flour batter and then deep fried in oil and mixed to spicy mixture. Don't ever ask for idly fry or fried idly at Saravana Bhavan in Chennai. You will be disappointed. They will give you mini idlis fried in oil with idli chilli powder topping. Actual fried idly recipe is the one given here. I think in Saravana Bhavan you have to ask as Kaima idly. In some hotels, they call it as idly manchurian.